Imagine a world in which no prejudice exists regardless of race, creed, color, gender or developmental challenge. This is the vision upon which United by Music North America is founded, as use the power of music to achieve this bring people together and achieve this goal. The United by Music concept, was originally created in The Netherlands in 2006 by Joris van Wijngaarden, a Netherlands health care industry executive. Entertainer Candye Kane worked with van Wigngaarden to hone the concept United by Music in The Netherlands. When van Wijngaarden wished to expand this unique program to North America, Kane suggested he speak with nonprofit industry expert and music supporter Barbara Hammerman. He did, and the result was a methodical process of testing the concept in the U.S. and Canada and the founding of United by Music North America by Hammerman and Amanda Gresham, music festival and event producer. 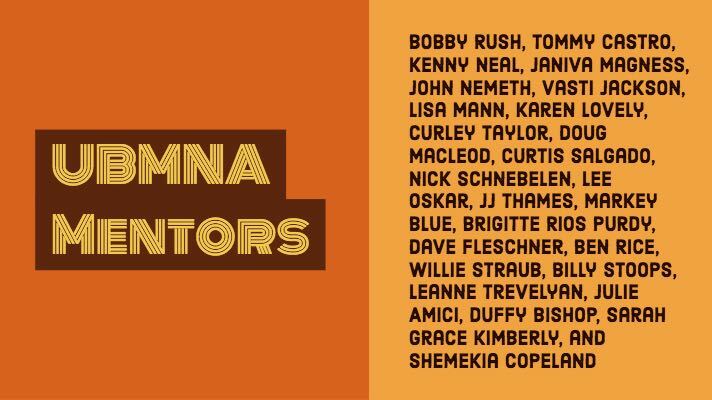 Hammerman and Gresham, work with a team of professional musician mentors* and supporters, find the musical talents for the program, work in weekly sessions to create performance shows and play at festivals and events. There is no fee to the artists to be a part of the program. Once selected, all mentor sessions and other activities are primarily paid through founder funding and generous donations from the public. 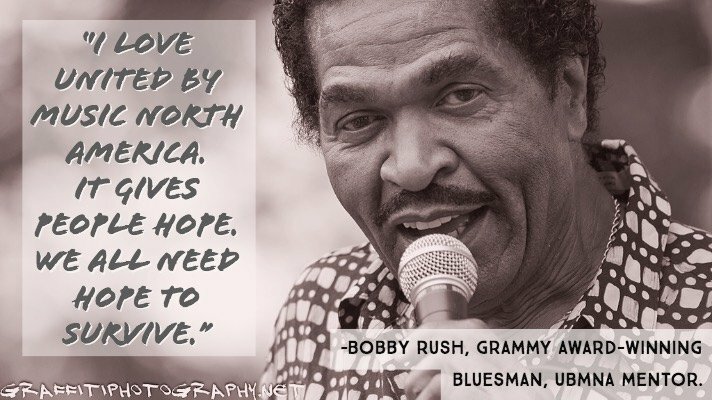 United by Music North America is a registered 501(c)(3) charitable organization. Amanda and Barbara worked with Joris’s team in The Netherlands and with Candye to discover the core of the program and to shape it so that it could be replicated in North America. They created a rough draft of a business plan and put together a focus group of Barbara and Amanda’s colleagues to review the plan and to share their thoughts with Joris’ team from The Netherlands. Those individuals met for a three-day retreat. 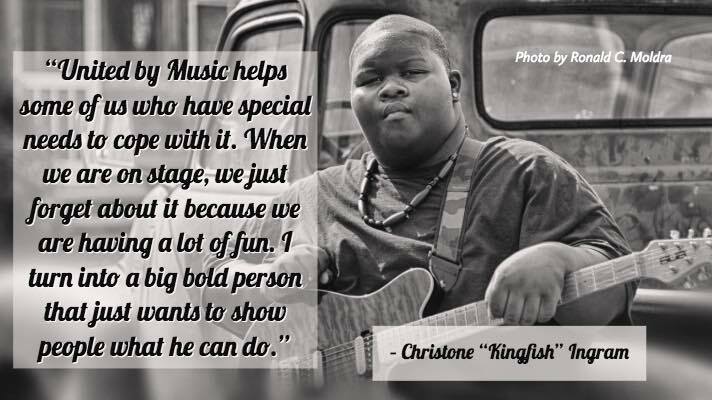 Arthur Steinhorn, a Portland musician was then employed by Special Olympics Oregon and had considerable music festival experience, was invited to join that group. From that gathering, the business plan was refined to reflect certain cultural differences between North America and Europe. The decision was made to create a way to demonstrate this program to live audiences in order to cultivate an awareness of United by Music’s mission. What emerged was the first Showcase Tour in 2010. This two-week tour, with support from the European-based United by Music, took an ensemble composed of program representative musicians through nine cities in the U.S. and Canada. The tightly scripted 60-minute program of entertainment and information concluded with a Q &A session. The only “ask” was whether audience members felt this program would have value in their community. If they agreed that it would, they were asked to consider working with United by Music NA to develop a team in each of the nine Showcase cities. As United by Music North America moved from the Showcase Tour phase through a methodical follow-up with the local teams, there was a natural evolution of communities that exhibited more initial strength than others for what was required to take UBMNA to the success. Due in large part to the relationship that United by Music was able to develop with Portland through Amanda’s involvement with the city’s signature Waterfront Blues Festival and Arthur’s expertise and interest in the project, Portland was selected as the site for the first United by Music program development in North America. The other communities that participated in the initial Showcase Tour are still being cultivated. Each will come “on line” with a training and performance program as soon as they are strong enough to sustain such a program. The Washington based program was begun in year three and is located in Gig Harbor, WA with program artists and mentors representing most regions in the state. With this foundation for success, UBMNA is fulfilling its mission raising awareness about how connected we all are through music, community and our universal aspirations to lead inspiring and fulfilling lives. We’re touring world-wide and year’ round. Bring us to your hometown! Look for Kingfish and another UBMNA program artist and ambassador, Miss Marlana VanHoose performing together with mentors, Janiva Magness, BB King entertainer of the year award recipient and Ben Rice, multiple Muddy Award winner and IBC finalist, on WoodSongs Olde-Time Radio Hour on your local PBS channel. A growing number of professional musicians support and celebrate the UBMNA band and program. 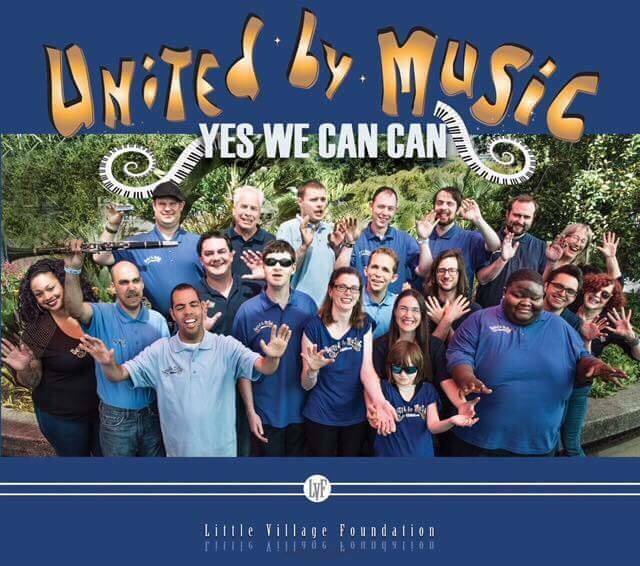 Get our Debut CD by donating to our UNITY THROUGH MUSIC™ Campaign! The album title track, YES WE CAN CAN, Allen Toussaint’s iconic song, serves as the calling card for United by Music North America. Book our Band • Start a UBMNA Program • Volunteer • Suggest Artists • Unity through Music™ Campaign.